The asteroid impact destroyd immediately all life in the area, and lifted up a lot of dust and different particles, which spreaded in the atmosphere around the planet. The formed grater is 170 km wide, and the impact also caused a massive earthquake which spread over thousands of kilometers. Around the same time there was also a massive basaltic eruption in current India, forming the Deccan Trap. There is a lot of dust, ash and volcanic gases in the atmosphere. Catastrophically rapid changes happen in the planetary atmosphere: the temperature plummets, the ozone-layer is destroyed and acid rains become common. About 75% of the Earth’s species went extinct. This included the non-avian dinosaurs, pterosaurs, large sea reptiles and many other marine species such as Ammonites and Belemnites. 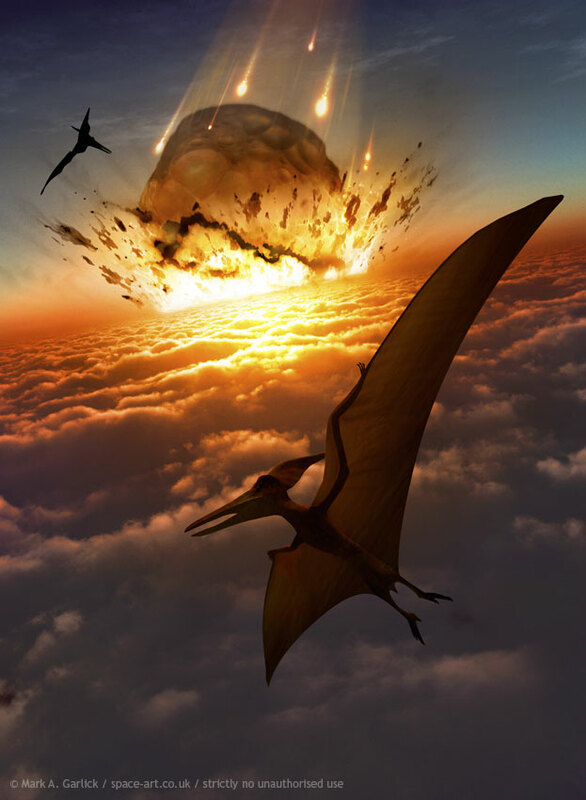 Smaller sized species, for instance mammals and birds, survived better than the large ones. Also vegetation survived surprisingly well.